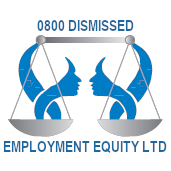 Employment Equity Ltd acts for employees in a number of ways. The services offered and the fee structures are set out below. The initial phone consultation is free and we work on a “NO WIN NO FEE” basis. Costs: Use your free call consultation to find out if you have a case. On choosing to represent you no fee will be paid until a monetary settlement is secured. Disciplinary Meetings: you have a right to representation. We can advise you of your rights prior to the meeting and also attend the meeting with you. Under a typical contingent-fee agreement, the “contingency” is usually the recovery of money, or something of value, for the client. If that contingency does not occur, the client owes the attorney nothing for his effort. The obvious benefit to the client is that he or she does not have to incur an out-of-pocket expense for attorneys’ fees. This may be particularly valuable to a client who does not have the ability or desire to pay an attorney by the hour to advance the client’s case. This risk-sharing feature creates an incentive for lawyers to work diligently and obtain the best results possible. A closely related benefit is the contingent fee’s tendency to reduce frivolous litigation by discouraging attorneys from presenting claims that have negative value or otherwise lack merit. Finally, the contingent-fee agreement has an implicit benefit for the client. The arrangement ensures that the advocate believes in the client’s case and will do the work necessary to obtain a positive result. Faith in the case and the desire to fight for the client may not always be present when advocates are guaranteed payment—without regard to the success or outcome of the case. A client who retains an advocate through a contingent-fee arrangement therefore receives the advocate’s implicit belief that the case has merit. Some information drawn from an article posted by Mike Myers.